In October, I put myself, two laptops and two pairs of crazy noise cancelling headphones on a plane and exhibited a text based game at Australia's largest gaming convention. For more extra context, you can find my announcement and discussion of my plans and expectations in a previous post. It's not required reading, but it does give more detail on those aspects than I'll be going into here. Going in, I had no illusions that In the Snowy Winter's Wake would be a good fit for the broader PAX audience. Most of the presentation and marketing strategies I used were a conscious effort to communicate some of the game's style and character in ways that would turn away anybody who wouldn't be interested in my game. I had anticipated that I'd share a quiet, relaxing weekend with two empty chairs and the odd heckler challenging me to justify my game's existence. The reality was far more intense and certainly far more positive than I anticipated, but I still credit much of that to effectively managing the "signal to noise ratio" by doing everything I could to make sure that only people who had a high likelihood of being interested would end up hanging around long enough to interact with me or the game (and this definitely happened a lot - I saw a lot of people bounce off quickly or scoff after a few seconds of reading my signage, but since I didn't have to waste their time and they didn't waste mine, I can only see that as a good thing). This meant I had a higher concentration of interested people surrounding my stand, which in turn meant that an everybody's-buzzed-for-this-text-game narrative could form since everybody standing around was buzzed. 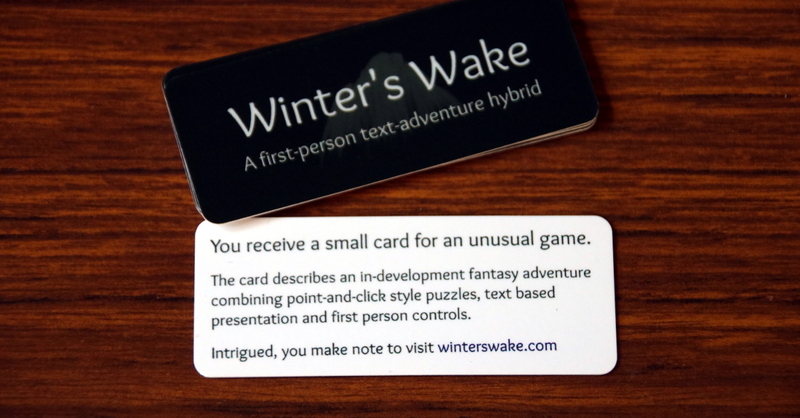 I also leaned on the same descriptive text style for presenting the game that I used for the Winter's Wake website and business cards that describes the reader learning about the game instead of actually describing the game. 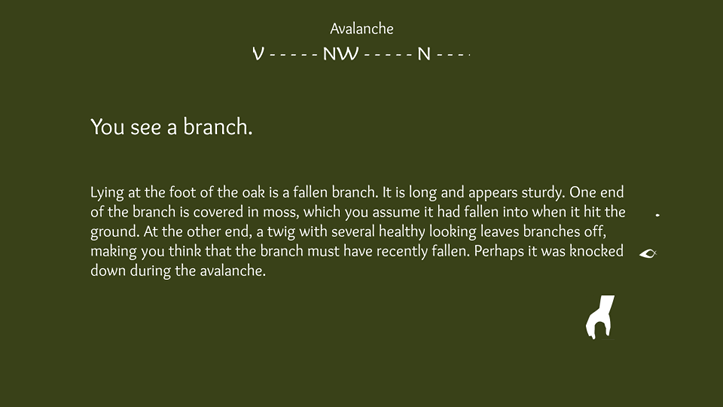 This is, and always has been, a crutch - Winter's Wake straddles genre boundaries in a way that is a difficult to describe and difficult to understand without first hand experience, and rather than addressing that, I've side-stepped the issue by breaking the ice with a brief combination of humour and tone that I hope convey the game's style and character in lieu of a real pitch. While I've received a lot of praise for the positive reception that Winter's Wake had, I can't take credit for intent. It was a welcome coincidence that my approaches to making the game less accessible to people who wouldn't like it and getting around the fact that I'm terrible at describing it turned out to resonate strongly with those who didn't turn away. I think though, that happy accident or not, it's important to reflect on and learn from these kinds of experiences so that whatever good bits are reproducible can be embraced and built upon for the future. Prior to applying to exhibit, I had previously released a demo for Winter's Wake. It was a couple of years old, so at the very least I'd have two years' worth of engine improvements to offer as something "new" in my PAX build. I wanted to go a bit more than just that though, and decided to include additional content. The game is playable from beginning to end, but most of the content beyond the original demo is still very much bare bones - in addition to content work required by new features (such as writing scene entry prompts and reworking scene descriptions to fit with them), I wanted to open up more of the game. The public demo is nicely bookended and very self contained, but it doesn't really give any indication of what the game's narrative is and where it might take players - it's a good stopping point, but one that I think doesn't give an opportunity for players to feel invested in what might be coming next. At an event like PAX, where it's easy for an individual experience that would be memorable on its own to be washed away by the intensity of everything else that's going on, having a bit extra for engaged players to sink their teeth into that (hopefully) leaves them wanting more feels like a good strategy. 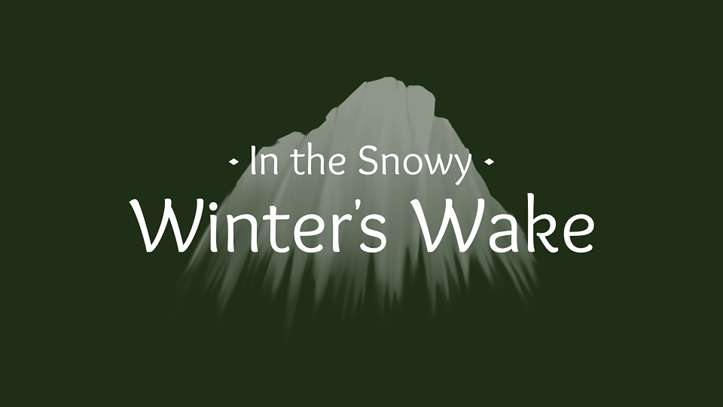 The new In the Snowy Winter's Wake splash screen and title. Ideally, I would have liked to have allowed players to reach the game's midpoint, where the initial plot has been established, most of the game's environments have been opened up for exploration, and key events are about to unfold. With the limited time I had available, and with the amount of extra polish I'd need to give a dozen or so scenes, I wasn't confident that this was achievable, so I set myself several possible stopping points for my PAX builds, each leading towards the next. This let me be flexible when other tasks needed my attention and meant that I would be prepared to present the PAX build in a way that didn't feel "unfinished" no matter where I ended up wrapping things up. In the end, I only made it as far as my second planned stopping point, prior to most of the game's locations being unlocked for exploration, but after players have been given their initial objectives that kick the story into gear. I was disappointed to not get farther along, but this felt like it was still more likely to leave players wanting more than the neatly wrapped up demo. I put a little "Thanks for playing!" cutscene that indicated that players had reached the end of the PAX content. A couple of days before PAX started, I figured that I'd done enough work on the remaining locations to allow players to continue through up to the previously mentioned mid point, and put a note in the cutscene to indicate that if players wanted, they could continue to explore through less-polished content. Winter's Wake's composer, Anton Riehl has been working to nail down what we've been calling the "adventure theme" for the past year or so. We wanted to land on a motif that gave a sense of impending excitement, and the possibility of adventure in the unknown (it's a lot less work for me to write these words than it is to work out how to convey them through music!). The first time it is used is upon leaving the first scene, where a short refrain is meant to evoke these feelings as you embark on exploring the game's early environments, but we arrived at this by doing progressively less and less grand iterations. The second to last iteration ended up being a little too long, but it still hit everything we wanted, so I implemented it as menu music (something we didn't have until just before PAX). This does a good job of setting the game's tone and allows the first time it appears in-game to call back to the longer variant from the menu. Having menu music also meant that when players first approached the game at PAX, they'd be getting a taste of music the moment they put headphones on. When the first Winter's Wake demo shipped in 2015, I'd planned to update it every month or two with engine and updates that reflected development. With that in mind, much of the environmental audio was quickly slapped together. It worked, and I've received a lot of positive comments about it (enough that updating the demo became lower priority than continuing development), but it was never representative of the quality I am aiming for in the finished game. PAX provided a lot of motivation to revisit this, and with the game's foley artist, Jasmine Serrano unavailable (but still being enthusiastically supportive from the sidelines), doing a polishing pass on the game's soundscapes fell to me. Most of the placeholder sounds from the original demo had unwanted background noise (passing aircraft in some of the forest bird sounds, for example), which I was able to pull out using Audacity's super handy "spectral editing" mode. The amount of audio work required to flesh out additional scenes played a big role in determining where the end of the polished PAX content would be, and while there's still more work to do in the early scenes before release, removing unwanted sounds and adding in a few new pieces of ambient audio for the PAX build made everything feel a bit more crisp and real. Since I needed high resolution artwork for non-game use, I knew that I'd need to update the game's splash screen to match whatever I ended up using. With so many other responsibilities landing on my head, I decided to bring Pablo "kednar" Lopez Soriano onboard, a talented artist and friend that I've collaborated with before and knew would be up to the task of taking my original mountain scribbles and re-creating them while maintaining their style and character. I'd previously decided to move away from the original triple mountain design and focus on the one that felt most interesting/powerful. kednar likes to work with a live video feed going, and in the midst of my mad rush to get everything ready for PAX, it was nice to have some company and companionship over the couple of day or two that we spent getting it right. kednar's work enabled me to solidify this important part of the game's visual identity with a lot less time and anxiousness than doing it on my own would have required. To be honest, the original designs were mostly the result of doodling - before kednar came onboard, I was budgeting a week and half, and how quickly I could get this particular piece of art together impacted heavily on print turnaround and submission deadlines for supporting material. A comparison between my original mountain artwork (left) and kednar's revised version. I added several smaller visual touches as well. In addition to a new interaction icon for using a musical instrument that I quickly knocked together in Inkscape on the morning of the second day of PAX, I also updated the presentation of the vertical orientation indicator (which was a much more considered change). In place of the temporary right-angled-triangle thing I had going on in the public demo, the game now has a more organic feeling arrow that tapers off into two whispy tails that cross back and forth past each other as they fade out. The old mid-point square dot is now the shape of the negative space left where the arrow tails cross over, and nestles into the arrow in a way that (I hope) communicates that the two visual elements are related. I also added some slight rotation to the arrow as it moves away from the mid-point that (I hope) helps convey a sense of "looking up and down" that players can latch onto and further reduce the short period of time it takes to work out what it's representing. I also finally sat down to add automatic capitalisation and spaces to scene names. What was once "village_gates," is now "Village Gates." A small thing, to be sure, but definitely a cosmetic rough edge that many people brought up when playing the Winter's Wake demo or other Icicle games. Something that sat on my list of "nice to have if there's time" features was updated VR support. I'd put it firmly on the tail end and wanted to be certain that the game was as polished as I needed it to be for exhibiting before I touched any of the additional work that would be involved in providing a solid VR experience. 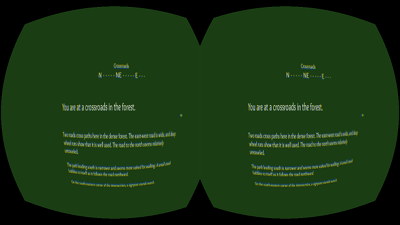 On top of everything else I had to do, VR support would involve updating OpenHMD, adjusting font sizes to be more readable, adjusting text length to comfortably fit on screen, and adding some extra VR-specific controls to help with repositioning/reorientation. I find that people are far more tolerant of and willing to see past rough edges in in-development games that use familiar input/output mechanisms than they are of ones that use unfamiliar ones. 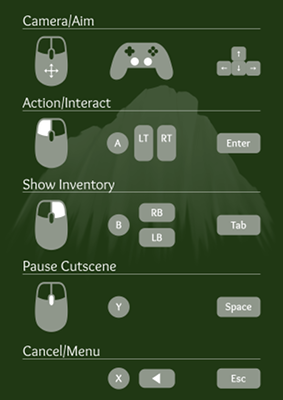 You can give an average person an unpolished version of a game with traditional mouse/keyboard controls and monitor based display, and in spite of having a less-than-great experience, they'll be able to build expectations for where it may go. In my experience, giving an average person an unpolished version of a VR game will come away with the impression that it's a less-than-great game. I think this is just the nature of new tech and new mediums - until there are broadly accepted "quintessential" experiences, it's hard to have a frame of reference to appreciate unfinished (and sometimes even finished) works within. For this reason, when it came down to the line and I felt like I still needed to do more work on the game itself, I decided to not do VR for PAX Aus. With more time to polish into the new year, I'll be able to give VR players a better first experience later instead of a mediocre or potentially offputting one sooner. I did have a shortcut set up for switching to stereoscopic rendering at runtime though, which I toggled for players who were interested in VR support. Like with VR support, there were a number of other long standing items on my todo list that I needed to weigh up the value of squeezing in before PAX against putting off till after. One that I decided to go ahead with that may or may not have been a good idea was returning to the game's original name, "In the Snowy Winter's Wake." I can't remember who's idea it was, but early on in development, someone worked hard to convince me that a shorter name was needed and, for a time, was successful. Over the years, I found myself missing the original name more and more. On one hand, it made sense to do this alongside updating key art and splash screens with kednar's new mountain, but on the other, I didn't get it done before I had already submitted artwork for printing. The new splash screen and title look great on the splash screen, but I didn't get time to update the main menu presentation, so that still shows the short name. Reflecting on switching back to the game's longer name. When the lightweight machines I'd intended to exhibit with failed to run the game as well as I'd hoped, I ended up spending several days working on optimisation using perf and valgrind to identify bottlenecks and heavy points. In particular, the biggest gains came from updating the renderer (which I plan to entirely re-write before release) to not generate multiple new textures every frame in some situations. I wasn't able to end up getting the game running at a solid 60FPS on the machines I'd planned to exhibit with, but the performance optimisations I made were able to let me run smoothly on fallback hardware. The planned renderer re-write will make most of that work redundant, so I feel less good about this than I do most of the other PAX prep work, which directly contributes to bringing me closer to release. If I had've known ahead of time, I might have prioritised the renderer re-write, but without that, the optimisation work I did was necessary - the price I paid for not testing on my planned hardware sooner! Before leaving for Melbourne, I also took time to add in several new keyboard shortcuts. I implemented support for increasing and decreasing input sensitivity on the fly, and added a shortcut that would insert a special message into the game log. The sensitivity controls ended up being very helpful. Players seemed to appreciate that they could adjust the sensitivity themselves, and not having to hover over players to adjust settings for them freed me up to talk to more people. "If the controls feel too sensitive or not sensitive enough, just mash the minus or plus keys until it feels right," became part of my spiel when setting people up to play. By contrast, I didn't end up using the log message shortcut, but if I'd spotted a bug or something that I needed to think about/address after PAX, being able to do a search for "PAX AUS 2017" in game logs from the event would have saved me a lot of hassle (I do wish that I had used this to highlight interesting playthroughs). One thing I didn't end up having time for before PAX was extended testing. The person I had lined up to do most of my testing wanted to wait for the "final" build (which I didn't up having until the morning of the first day), and I was so focused on getting everything ready that I didn't have time to test anything beyond confirming bugfixes and features as working as I marked them off as done. My friend, supporter and sometime-collaborator Caroline Choong ended up doing the bulk of testing on builds ahead of PAX, sitting next to me on a couch at my Melbourne accommodation, playing through the game as I continued development. Thanks to Caroline's attention, I nailed down several significant bugs, a bunch of typos, some missing scene elements and a few puzzle logic errors, all of which would have had a big impact on how the game behaved on the expo floor. Some code commits from overnight development during PAX. As it was, I still needed to do development/bugfixing/testing on the nights and mornings before PAX. Primarily, these were fixes for typos and minor logic/state bugs, but I still managed to break a build with a small oversight (I'd accidentally entered a scene state update as an object state update in a reworked puzzle). Thankfully Icicle takes less than a minute to build and since I was committing all my changes to git, identifying the problem was as trivial as rolling back to a previous build would have been, and aside from another exhibitor who didn't get to play before they had to head back to their stand (something I'm super bummed about! ), nobody was the wiser. This is pretty risky though, and I think that even if it feels like the risks are acceptable, it's still best to plan and budget in a way that doesn't rely on being able to do development work across the event - I certainly would have appreciated and benefited from getting more sleep! Although I arrived at (and needed to arrive at) the kind of stand I ended up going with fairly quickly, designing a stand for a game like In the Snowy Winter's Wake proved to be pretty daunting. Being predominantly an imagination oriented experience, it felt important to be wary of anything that might give specific impressions of things within the game. Some of my earliest ideas for key art for the game were to try to mimic 80s text adventure box art with an elaborate fantasy, but it quickly became evident to me that there was more power in minimalism, and this wound up feeling like the best sort of approach to use for the stand as well. With submission and printing deadlines looming from the outset, getting the stand backing sign designed was top priority. Since this was the largest piece of art, it couldn't be finalised until kednar's revised high res mountain art was ready. I could work on it using the old low res image, but I couldn't do final exports. The Indie Pod I'd purchased in the PAX Rising area included printing for two 950mm x 1910mm panels, a semi-circular table, and an enclosed space below. The artwork specs indicated 10mm bleed margins, but there was also a small additional area that was covered by the frame in which signage was installed. From memory, this exceeded 10mm - not much, but something to be aware of if there's any critical detail close to the edge. I also tried to be conscious of the space that would be covered by my monitors, and used a best-guess height of 450mm to make sure I had clearance. Various iterations of the Winter's Wake stand signage (first version is the best). I knew that I wanted one panel to focus primarily on the game's title and the mountain design. Without screenshots or other visual elements, the mountain and title make up the bulk of the game's visual identity. They're the bits that lead people to say "Oh yeah, I've seen that game," especially now that I've made other things that use the Icicle engine. Keeping my goal of making the game less interesting to people who wouldn't appreciate it, I decided to stick with the descriptive text style I'd already used on the game's website and business cards. Since I didn't end up deciding to revert back to the game's longer name before this needed to be submitted, it read "Winter's Wake," with a subtitle of "A first-person text-adventure hybrid." Being a wall of text, the second panel immediately gets rid of anybody not interested in reading. The heading and first paragraph introduces the descriptive style and the gimmick that the sign is anchored around - anybody turned off by that isn't going to dig the game. The second paragraph briefly describes the games premise from mechanical and narrative standpoints. Both are too shallow to be useful, but they'll still turn away anybody who's explicitly disinterested in fantasy games or unconventional controls. For anybody still left reading, the third paragraph is a joke to reward people for the time they've invested. I went through three drafts before I found the right structure and font size (which together set some boundaries for how much I could say). Feedback from friends reminded me that noting supported platforms on the signage can help people find games they can play and avoid ones they can't, so I popped them on the first panel. I also added the Icicle logo to both and a faded copy of the mountain onto the empty space below the second panel text (from a balance perspective, I wanted to keep most of the empty space for the first panel to make its content stand out more. With the backing board art submitted, t-shirts were the next highest priority. I wanted to have t-shirts that highlighted me as the game's developer and gave authority to the volunteers I had helping me out during PAX. I didn't go through much iteration with the design for the shirts. I tried a few different arrangements of the game title and the mountain design, but the one I'd used for my first run of business cards made the most amount of sense. I get most of my t-shirts printed through RedBubble and have found them to generally be good at handling partial opacity, so I was able to use the new mountain image without any changes. 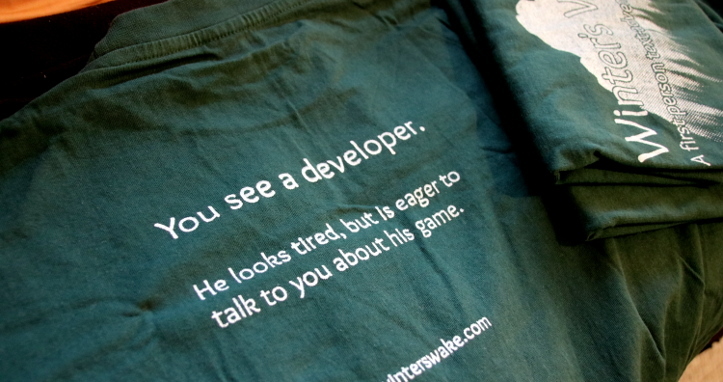 The front and back of my developer t-shirts. For my own shirt though, I wanted to have something a little extra. After doing the website, the business cards, and the PAX signage, popping descriptive text on stuff has started to feel like an obvious thing to try. I still took a moment to ask myself if it's a good fit or not though - it feels important to not overuse it. I liked the idea of a little joke to help keep anybody that I couldn't interact with directly feeling positive until I was able to get to them, and in this case, putting, "You see a developer. He looks tired, but is eager to talk to you about his game." on the back along with the game's URL was something I arrived at fairly quickly (quick enough that I don't have any previous revisions saved, though I do remember trimming it down a little to allow the text to be large). Unfortunately, RedBubble only do front or back printing, and I had to look at getting my special t-shirt printed somewhere else. I phoned around several local t-shirt printing places, who all told me that what I was after with the mountain fading out just wasn't possible. I'd suspected that I might hit hurdles with this, and had done some experiments with using a halftone effect. When I finally managed to get a printer who wouldn't hang up on me (the primary business model of these places is typically providing large orders of uniforms to institutions and corporations, so the effort vs reward proposition of my little two shirt run with its awkward requirements is understandably not very appealing), I began the arduous back and forthing involved in discovering how small individual dots/holes could be before their internal processes would gobble them up. Wheels turned a lot slower than I expected/was lead to believe (by the time I was that deep, I didn't have time to start working with another printer), and in the end, my shirts became ready for pick-up on the last working day before I flew out for PAX. The shirts both appeared to have stretched/moved a little during printing, making the text on the back fuzzier than I'd have liked, but they were a better option than the spare RedBubble t-shirt I'd ordered just in case. Before I'd heard back on whether or not I was going to be able to exhibit, I took a gamble and ordered a stack of business cards. I figured that if I wanted to avoid paying for express shipping, I needed to order them straight away. After chatting with my friend Tim Dawson, who'd had a little bit of experience exhibiting his own (very cool) game and weighing up the amount of attention I was expecting to get, I settled on 400 as a good number and ordered 600 to be safe (I'd planned to send leftovers to Anton and Jasmine after PAX, so extras made sense). Without thinking, I just used Moo's re-order feature, and soon 600 Winter's Wake cards with the old mountain design on the front (less of a big deal since they're super small) and the words "in-development" on the back (slightly more problematic given that eventually that will misrepresent the game's state) were on their way. The four badge designs I went with. Before leaving, I designed several pin badges and ordered a cutter that would punch inserts to fit my 25mm badge press (previously I'd cut all my badges by hand) and a pack of 500 badge parts. I knew that I wouldn't have time to make them myself, so I enlisted the aid of Miriam "Mim" Roser (my partner and third stand volunteer) to punch and press around 300 badges before she flew up to join me. 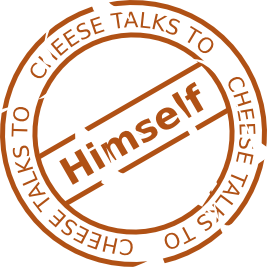 With such small badges, it was difficult to do the kind of extended descriptive text treatment I'd done for the stand signage and my t-shirt - I had attempted to do a spiralling text thing, but wasn't able to make anything I was happy with in terms of readability. I ended up doing four different designs, including one that says "You see a badge for an unusual game." around the mountain. The last thing I ended up designing before I left was a controls sheet that I could pop in A4 display stands and sit next to each machine. I've configured the game's current hardcoded bindings to closely match what's normal in first person games, so ideally it should be intuitive to most players (plus there are so few controls that a little trial and error discovers them all pretty quickly). At an event like PAX though, I think there's value in the reassurance that a control sheet can provide if someone manages to sit down without talking to someone first, or if they've been playing a while and want to double check something. I tried to keep everything big and readable, but in hindsight, I think it would have been beneficial to note the Y axis inversion and input sensitivity controls that I added before PAX. As is becoming a tradition for me, I made up an info card to hang from my lanyard that has my avatar and Twitter handle on it, and lists projects I've recently worked on. I find that that it helps me be identifiable and gives some conversation prompts for anybody who wants to talk to me but doesn't know where to begin (also, I always forget the relevance of most of the stuff I do, so I never think to bring any of that up). I didn't manage to get it ready before I left, but I sent it through to Mim, who was kind enough to print and laminate it for me and brought up with her when she flew up to join me closer to PAX. This sort of thing isn't so relevant when there's a big stand telling people what you do, but I find it a nice thing to have. 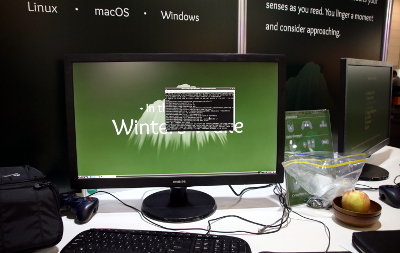 I had initially hoped to exhibit the game on two EeePC 701 netbooks. They're low powered, light weight and most importantly, super small. Since I had to fly to attend PAX, sticking two lightweight laptops in my carry-on luggage made a lot more sense than shipping desktop machines up to Melbourne. Unfortunately, the game ran at around 14 frames per second and even after the performance optimisations I made in the leadup to PAX, I wasn't able to get it running faster than 40-ish (I'm sure I'll get there eventually, but not till after a future renderer rewrite which was far too big a feature to tackle with the time I had available). My target for exhibiting was 60 frames per second, so I tried some other options, including buying a Raspberry Pi, which I was able to get the game running at 25 frames per second on (it had some rendering issues though). 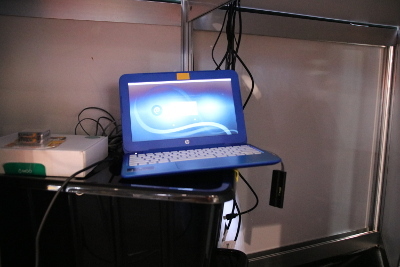 I ended up exhibiting using a borrowed 11" HP Stream d008tu running Debian and my 2012 11" MacBook Air. Other equipment that I had lying around home that I packed to take with me were two pairs of wired Logitech keyboards (feeling a touch too paranoid about managing battery charge and things disappearing, I went with cabled stuff as much as I could), a 6 point power board, and two wired Logitech F310 gamepads. I knew from experience that the PAX expo hall would be uncomfortably loud and that if I wanted Winter's Wake to be properly appreciated, I'd need to do something to address that. My first attempt at solving this problem was a pair of Plantronics Backbeat Pro 2 noise cancelling headphones. After some tests at home comparing how they performed against a kettle, a lawnmower and a loud Youtube video of the PAX floor, these just didn't seem to be capable of blocking enough noise to be useful. Thinking that maybe noise cancelling headphones weren't the right solution, I purchased two pairs of Sennheiser HD280 PRO noise isolating headphones, which are great, but also weren't quite going to do what I was after. While shopping for some other stuff at a entertainment/electronics store, I convinced a service assistant to turn up a stack of stereos while I tried out a bunch of noise cancelling headphones they had on display and eventually settled on two pairs of Bose QuietComfort 25 noise cancelling headphones, which were what I took to PAX. As a bonus, I also bought some 3.5mm male to male audio cables mistakenly believing that they were extensions. Whoops. The night before I flew out, I copied my codebase (which is a git repo, so versioning and history is carried across) to both of the netbooks, a USB drive that I put in my checked luggage, onto my camera's memory card and onto one of my web servers. If my checked baggage got put on the wrong plane, I'd still be good to go. If I somehow misplaced my carry-on luggage, I could buy two netbooks in Melbourne and make things work. If the plane went down in the sea and I lost my checked luggage and carry-on luggage, I could potentially get up and running from the online backup or my memory card if I didn't have net access (I always like to treat the net as being transient - it often is). Monitor rental looked like it was going to be $100 a day per screen, and with PAX running for three days, that didn't seem to be the best kind of decision when new monitors cost around $200 each. Before I left, I purchased two 27" Philips monitors online from a Melbourne store, which Caroline was able to pick up for me in person. I also reached out to friends in Melbourne to see if anybody was keen to buy new monitors after PAX, and managed to find homes for both of them, letting me be cost-neutral on the monitor front. When I arrived in Melbourne, I also purchased two wired Logitech mice, two Steelseries mouse pads, two 3.5mm audio extension cables to make up for the male to male cables I'd bought before leaving, four 2m USB extension cables, two 1.5m HDMI cables, and two small faux woodgrain bowls to keep badges in. When unpacking and testing the monitors, I found that they had a bunch of brightness, contrast, colour temperature, and Things That I Just Can't Understand Anybody Wanting settings that I had to work through and turn off/adjust to make the game look as I expected it to. This is more of an issue with Winter's Wake specifically, where there's only one colour on screen at a time (colour perception is relative, and with other colours present in a complex visual scene, the extra context makes things look less weird), but it is something that I hadn't considered needing to deal with and it cost me a bunch of unbudgeted time. When setting up on the Thursday (day before PAX started), it became evident that I'd overlooked a few things. Firstly, the storage space beneath the table was a void with no bottom, meaning my laptops would have to sit on carpet (something I hadn't considered at all), so Caroline, who was helping me bump-in (that's roadie slang for set up) and I headed back out and bought a pair of black 50L plastic storage tubs. These were less than ideal as shelves, but they were the most practical solution so far as versatility and usefulness after PAX went. The other thing I had overlooked was that I needed three USB ports available on each machine, when neither machine had three (laptops have keyboards on them and when doing mock set-ups, it had slipped my mind). I sent Caroline off on an emergency mission to procure some USB hubs. Thanks to my good friend, fellow developer and Winter's Wake stand volunteer Sanatana Mishra (Nart) booking accommodation nearby, I was staying walking distance from the PAX venue. Since I was staying so close, Caroline (who was also volunteering to help out) and I went down to scout out the stand and the venue before carting gear down. Picking up exhibitor badges and identifying any potential hurdles ahead of time always feels like a good idea where possible. We got down there at about 8:00am, and at that time, there were only two or three other exhibitors setting up in the PAX Rising area. By the time we found some tubs and came back with gear, it was 10:30am and it became increasingly busy. I think if we hadn't left, we would have been able to do set up, resolve the technical issues with my stand's built-in lighting, and get testing and tagging over with by 10:00am, but as it was, we didn't get out till 1:00pm. During set up, it became clear that with two 27" monitors, there wouldn't be enough room for both control sheets, so I made do with one sitting between them. The downside of that was that the A4 display stand I used was pretty reflective, and the angle meant that players sometimes had to lean a little to see them without glare. The Winter's Wake stand during setup on Thursday showing cables in their tamed state. The white tabletop highlighted the seething mess of black cables that I hadn't considered ahead of time. Making use of what was on hand, I tightly wound the plastic sheathed wire cable ties that the HDMI cables came with around the bundle of cables for each machine, both near where they entered the table and at the point where the cables needed to diverge (leaving enough length for mice, gamepads, and headphones to move freely). This still wasn't great, but it looked a lot better and made things a little less likely to get tangled. Even with the ties tightly wound, I could still slide extra slack through the bundle of cables if needed (which game in handy for a couple of wheelchair-bound players). A black tablecloth would have helped cables blend into the background a bit better, and I'd back and forthed on whether or not to get one, mostly because I didn't have any bright ideas on how to anchor a tablecloth without risking stuff being accidentally shifted/pulled off the table if someone tugged or got caught on it. Alternatively, if I had made a game about unruly snakes, then it would have been on point. Bundling the cables beneath the table made sense as well, since I wanted to make sure I was consistently plugging the right peripherals/monitor into the right machine. The audio extension cables had grey cable ties, so I used those for one bundle and black for another, keeping them nice and identifiable. On the way out after setting up, we bumped into Salty Studios, another Tasmanian based dev team, who had shipped their machines as checked luggage on their flights. They were nursing a cracked monitor and a desktop which had had its components shaken loose and damaged the motherboard. The desktop had the latest version of their game on it and they ended up falling back to and older codebase from one of their personal laptops. Showing the kind of spirit and ingenuity that I think goes hand in hand with being the kind of people who can design systems and solve problems, they made the best of the situation by setting up their broken gear as a backdrop and doing live development at their stand. I haven't had a chance to catch up with them since PAX, but I got the impression that while still far from ideal, this kind of presentation ended up being interesting to attendees. The Winter's Wake standing out among its neighbours. The stand I was allocated put me in an interesting position. There were definitely a lot of pros, but also some cons. I was in an easily describable position, not too far from the cafe, positioned on a major thoroughfare facing a T intersection that gave my stand good visibility from a distance. Being on the outside, facing away from the rest of the PAX Rising exhibitors that I was less visible to people who were specifically there to look at indie games though, and also meant that I had less stuff between me and some of PAX's noisier exhibitors. The starkness of my signage helped it stand out amid the more colourful and detail-dense stands around me, and made it easier to spot/identify my stand from the other end of the expo hall. The sign in particular seemed to attract a lot of attention - people were constantly stopping to take a photo of it, and when I caught someone doing that, I'd turn my back to them so that they could see my t-shirt and more often than not, that would elicit a laugh or exclamation as they took another photo. "Still tired, still eager," has been my mantra while writing this article. The t-shirt also caught the attention of many developers, building an unexpected sense of camaraderie when while passing, they stopped to offer, "That is so true," type sentiments after seeing my shirt. It highlights something that I think probably isn't acknowledged very much, and certainly doesn't seem to be very appreciated. People put in a lot of work and effort to exhibit at events like this, and without a willingness to push through the less pleasant aspects, we just wouldn't be there. I'm wary of celebrating tolerance of poor conditions or promoting the sacrifice of personal health (after all, we pay money to be there, not blood), but I do think it's important to recognise that we are lucky to be surrounded by passionate, committed people. I ran out of business cards for the game on the morning of day two, and had to fall back to using my personal cards, which also ran out before PAX ended. Given that I was expecting to have maybe a few dozen people be interested enough to play the game, this was absolutely mind boggling. At the start of the second day, my dwindling cards lead me to lament not putting the game's URL on the stand signage. Given how many photos I'd seen people taking, and how many of those were likely to wind up on Twitter, Instagram, Facebook, etc., I feel like I missed a big opportunity to get the URL out there and reduce barriers to discovery. Mim's hurriedly drawn "we're out of business cards" sign. I also ran out of badges pretty quickly. I wish that I had've been able to put the game's URL on those as well, but that was never something that would work well. Having multiple designs meant that people usually lingered a little longer before disappearing back into the ebb and flow of the expo hall, and I think maybe that an extra thirty seconds for the experience of playing to work its way into players' memories before the intensity of the next stand they visited washed everything away probably helped. There were a few groups of younger people who scurried by, grabbed handfuls of badges and then scurried off. I don't really have a big problem with that in general, but given that I didn't have enough to go round, that bummed me out, and I eventually moved the badge bowls to the middle of the table so that they were harder to reach unless you were willing to step in front of the crowd of onlookers. When planning out how I'd manage the stand across PAX, I'd enlisted the aid of Caroline, Nart and Mim with the expectation that I'd have them each cover a one to two hour period on one of the three PAX days, which would allow me to have a break if I needed one. With the huge response I received, I wound up staying on the stand all day every day without a break, and ended up having at least one volunteer helping out at all times. I am super thankful for their willingness to put in extra time - I still would have manned the stand alone, but I think we would have had far fewer people playing/having the opportunity to talk with someone about what the game was. Find out whether you need to have something to keep your equipment off the ground - this impacts cable length too! My volunteers are wonderful, generous people that I am very thankful for! The positive reception that In the Snowy Winter's Wake garnered was beyond anything I could have imagined. If somebody had told me that there would be a crowd of people queuing to play an experimental text adventure at an event like PAX in 2017, I probably wouldn't have believed them. It's still a little hard to process now. I don't have any frame of reference for comparison since this was the first time I'd shown off a game in this kind of environment, but in addition to enthused and impressed players, I had many developers drop by to tell me that I was "killing it," "crushing it," "slaying it," or otherwise destroying something. My three primary goals for PAX were to observe a range of players first hand, to gather more game logs, and to get practice at pitching Winter's Wake. I didn't end up with time to try to organise press appointments and I didn't anticipate getting a large number of players, so my expectations on those fronts were low. 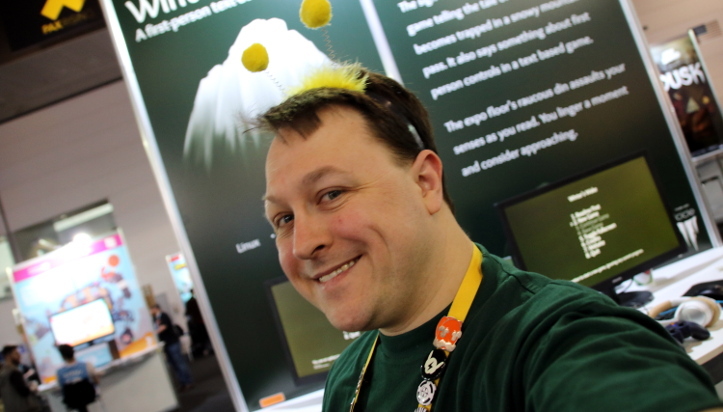 Without these headphones, it's hard to imagine that Winter's Wake could have been accessible at PAX. Watching people play text based games is an interesting thing. Most people have a "reading face" that reflects the concentration involved with interpreting and creating imagined spaces and events. In the occasions where I've previously watched people play Winter's Wake, it's typically been people I know, and/or in a one-on-one type context where players are interacting with me directly while also playing the game. By contrast, people playing at PAX, isolated from the expo floor by noise cancelling headphones, hunched atop little stools and wrapped within cocoons of imagination, gave off body language that suggested frustration, anger or discomfort. Invariably, this would be briefly broken by a quick smile or laugh as they looked at the sun, but that would be immediately replaced by slight frowns and wrinkled brows. I spent the first few hours of Friday expecting players to yell at me when they finished playing even though the vast majority of them made a point of letting me know that they enjoyed it. Coming out of PAX, I don't feel like I have the ability to read players' emotions as they play, with the exception of one person, who after playing told me that she wore her feelings openly so that they'd be interpretable. Because Winter's Wake (and any Icicle game by extension) is such an unusual mix of gameplay, it crosses genre boundaries in conventions that make it very difficult to describe succinctly. I can't say, "It's like X," without also adding the caveat of, "But it's also completely different to X." Myst-meets-The-Pawn-meets-Unreal-Tournament-meets-Quest-For-Glory might be accurate in terms of inspirations, but it does nothing to communicate what the game itself is. "First person/text adventure hybrid," or "A text adventure with first person style controls," sound evocative (which is great for piquing interest and luring people in), but still don't explain how those mechanics/styles work together. "There's a 3D world around you, but you can't see it. You have a fixed position camera in the middle that you rotate around via normal FPS style controls, and whatever you're facing, I give you a text description of. If you want to look west, instead of typing "look west," you turn to face west and the game tells you what's there. It also has positional audio, so as you turn, you can hear the world move around you. The background is tinted based upon the average colour of what would be visible if you could see, so if you look up, it might be blue for the sky, or if you look down, it might be green for the grass at your feet. Mechanically, it plays out as a single verb point and click adventure." "The controls are left click for interact, right click for inventory. Look around as you would in a normal first person game. Remember that there's a 3D world around you - you may need to look up or down to see things. The compass at the top indicates what direction you're facing, and the vertical orientation indicator on the side shows how far up or down you're looking. When you see an icon in the bottom right, that means you can interact with something. For example, a footprint icon on a path means that you press use to move to a new scene. If you see three dots, like an ellipsis, that means that it's a prompt that you have to click through. If the controls feel too sensitive or not sensitive enough, just mash the minus or plus keys until it feels right, and if you need to invert the Y axis, just press Y on the keyboard here. If you need a hand or a hint, just sing out!" Normally I would be happy to let players discover this stuff themselves while playing, but in an environment like PAX, where there's an audience and a sense of time pressure, it felt best to give a little explanation for the things that people seem to be most likely to get caught up on. I found it hard to get any meaningful sense of demographic bias among the people who played the game. Taking into account an assumed 18 to 30 white male bias among PAX attendees, and assuming that my best guesses about ethnicity, age, background and gender were somewhere close (it's not really my place to request that information), Winter's Wake's PAX audience seemed surprisingly diverse. I even had players who weren't native English speakers (the only demographic that I feel the game is significantly less accessible to since I don't currently have plans or resources to localise the game into other languages) offer positive comments on their experiences with the game. It was encouraging to see children drag their parents up (Mim recounts a story about how a younger person approached one of the chairs and told the adult accompanying them that they'd like to try. The adult responded that they probably wouldn't like it since it involved a lot of reading, but the younger person sat down anyway and had a good time) as often as more seasoned adventurers dragged their families along and talked about how this was similar to (but different from) games that resonated with them when they were younger. I saw this situation with roles flipped just as often as not, with parents and children both giving their families and friends a window into their own feelings about games. Photo courtesy of Mim. At Interface (an industry networking event presented by Film Victoria), I lingered by my stand instead of mingling near the food. While I was keen to check out other developers and their games, I was more keen to spend time observing talking and observing people playing Winter's Wake in an environment that was less oppressive than the PAX expo floor can be during the day. I had some lovely conversations with a range of different people, but my favourite was with two women from a copywriting agency, who played simultaneously and talked about their experiences as they played. As they sat down, the older of the two expressed that they didn't play a lot of games, while the younger was happy to jump in without instructions. As they played, their confidence and enthusiasm levels inverted. Both said they enjoyed the game and offered kind comments, but the player who seemed most wary from the outset appeared to be the most engrossed by the end, and talked about how it evoked memories of playing text based games in the 70s and 80s. From my perspective as a creator, having other people like what I make isn't as important to me as making what I want to make, but seeing people connect with their own pasts or with the people around them is very moving, and it's an honour to know that I've done something to enable that. Listening to people recount the ways that other games made them feel or explaining how Winter's Wake's unconventional interface reminded them of how they felt when they were first discovering interactive experiences is wonderful. 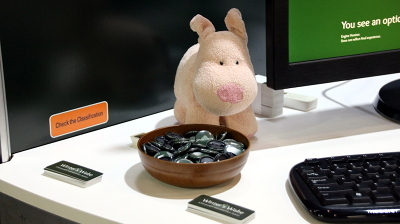 Across PAX's three days, I felt like I made some fleeting personal connections with people I didn't know, something that I'd never really expected to see on the expo floor when I've been an attendee. I had maybe a half dozen or so teachers approach me to talk about whether Icicle would be a good fit for educational purposes, sometimes from the perspective of a method for delivering content, sometimes from the perspective of an environment for students to create assessable works within, and sometimes both. I had people who run role playing groups approach me to talk about whether Icicle would be a good fit for designing and maybe even expressing parts of their pen and paper campaigns. I even had someone want to talk about its potential use as a virtual museum. I'm very open to these sorts of unexpected applications of the engine and hope to speak more with these people and others about what their functional requirements may be, but for the moment, shipping Winter's Wake is my priority, and the Icicle features that enable me to do that will be the ones that get pushed to the top of my todo list. Perhaps it was knocked down during the avalanche. Compared to when I launched the first Winter's Wake demo, I received far fewer suggestions for features that weren't already on my roadmap and/or weren't in line with the kind of experience I am trying to create. I feel like suggestions often come from one of two places, either a person's experiences have inspired them to consider something beyond what they've found, or they've encountered a negative experience that they are considering possible improvements for. Hearing fewer of the latter suggests that the refinements I've made and features I've added to the engine have helped give stronger direction to the game and also address rough edges that players struggled with previously. The most common suggestion I received was to add some kind of audio reading of scene descriptions for sight-impaired players. Screen reader support has been on my todo list since before I started development in earnest, and though I don't anticipate getting to it soon, it's definitely something I want to include in release builds of the game and its engine. Sometimes this suggestion comes in the form of voiced narration, and while I can see this working for some Icicle games, it's not where I want to take Winter's Wake - I specifically want to avoid performance impacting on what a player might imagine, infer or project when reading the game's text. Another suggestion that I enjoyed came from another game developer (Matt Trobbiani), who suggested an additional failure state for a particular puzzle. It was a nice way to squeeze in another small touch of humour and ended up being one of the first post-PAX changes I implemented. As mentioned earlier, I was expecting to have a significant degree of dismissive and/or veiled antagonistic reactions to the game. I've seen this a little with Winter's Wake prior to PAX (typically after having press coverage that results in the game being put in front of people who haven't intentionally sought it out) and a lot with other projects that I've been involved with which leave convention behind to try something different. I feel like my stand's presentation did a lot to minimise my opportunity to come in contact with these sorts of sentiments, though I did have three or so people challenge me to justify my game's existence/to respond to their not being able to see what problems I thought I was solving (which is a fair way to feel, but there are ways to express that without being confrontational as developer Alan Hazelden did). For the most part, I deflected these with the truth - I'm making this because this what I feel like making, and it is interesting to me to explore. A small number of onlookers waiting their turn to play. We didn't manage to get any photos of when it was really busy. Photo courtesy of Mim. As I've come to expect from feedback outside of PAX, players typically described their experiences as immersive using every word but that one. The combination of background colour and ambient audio subtly but powerfully support the sense of "presence" that I'm working to evoke. I didn't get any direct feedback on the changes between the previous demo build and the PAX content, so it's difficult to gauge the impact of the extra audio work I'd done, but I did anecdotally get the impression that the "adventure theme" appearing during the main menu and the Crossroads scene elevated the level of excitement and anticipation that players experienced, which likely played into feelings of immersion. It was interesting to see first hand the shape and role of nostalgia that people felt when encountering the game. Many people of a certain vintage were attracted to the game, and spent time remembering and describing their experiences with traditional text adventures, but these didn't seem to be on their minds after playing, except when it came to talking about ways in which the game isn't a traditional text adventure. While it might have nostalgic appeal, Winter's Wake itself doesn't seem to be a nostalgic experience. There were two common sentiments that came from the vast majority of players: people like the environmental audio and people like the music. This echoes feedback I'd received prior to PAX, though proportionally more people seemed to comment on the music - likely because there are more tracks in the game now. Players were more likely to mention environmental audio over music, and I think this is because the role that audio plays in supporting a sense of place gives it overt presence, while music's role in establishing tone makes it more subtle and less likely to be consciously noticed even when it is effective. The next most frequent comment raised background tinting, I suspect mostly due to it more effective at supporting/suggesting the surrounding environment than is typically expected. Interestingly, players seemed to often assume that the background tinting system is more complex than it is. It's hard to know how much background colour related feedback is the result of admiration of an unknown system and how much is the result of it doing what it's meant to do, but regardless, it's been a feature of note for many players. A couple of people commented on the brave toadstools, a description I wrote while attending PAX way back in 2014. Perhaps half of players took the time to praise the game's writing. This is fascinating to me, as I can recognise that while decent, the writing isn't particularly noteworthy. I think perhaps that the game's minimalism allows small moments that resonate with players to feel more present than they are. The number of sentences focused on evoking imagery is very small, but people refer to them as though they are a large part of the game. I've seen this as well with one of my other Icicle games, The Spicy Meatball Saves The Day, which players identify as being comedic, even though all of the game's few jokes are concentrated within the intro cutscene. Players receive an impression, and since there is very little in the way of ongoing stimuli that can override that, early impressions can last and resonate longer. My view has always been that the novelty of the mechanics and VR support will draw players in, but my writing is what needs to keep players engaged. I'm flattered by the positivity, and am glad to know that even without further polish, the writing is well received. Mostly though, it's good to see that not only does the writing elevate the game, the game make my writing look good. 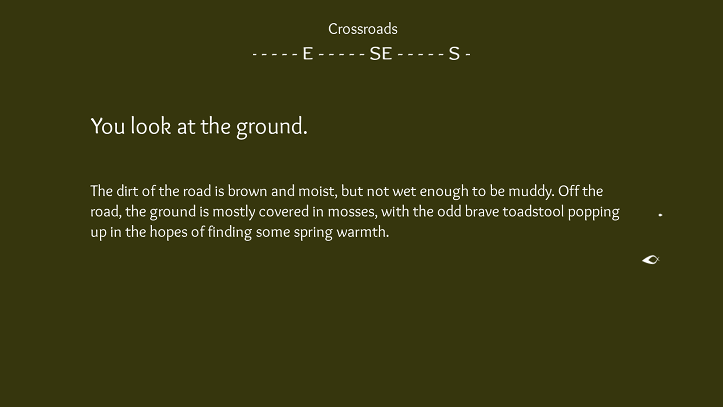 Other, less frequent comments touched upon the UI (mostly expressing like or dislike for the compass, or mixed feelings about description fade-in behaviour), controls (suggesting improvements or complimenting their simplicity), the uniqueness of the experience, and how it's exciting to see text adventures making a comeback. I also had some people come back to the stand to mention that they needed to hunt around a little to find the game - there's a viking metal band called Winter's Wake which I somehow managed to fail to discover when hunting up whether or not the name was in use by anybody else. If I had've had the game's full name (In the Snowy Winter's Wake) and/or the URL on the signage, that likely would have helped a lot in those cases. Generally, players enjoyed the game. Excluding the small number of grumblebums mentioned earlier, I spotted less than half a dozen out of the 204 players (according to my game logs) who didn't respond positively. The crowds of onlookers seemed intrigued by the stand, the game and my bumbling attempts to explain what it was they were looking at, and when it was their turn to play, almost invariably had something kind or positive to say about their experience. My number one favourite piece of "feedback" wasn't offered as commentary, it was a tiny map that I spotted a player had scrawled on the back of a business card. When players of the first demo I released in 2015 shared maps with me, it offered a lot of reassurance that I was on the right track. Artefacts like these are a window into the very subjective experience a player is having, and if someone can scribble a map in the kind of environment the PAX expo floor provides, then it shows a level of engagement and commitment to the experience that I wasn't really expecting people to have. In a few cases, people expressed interest in the underlying tech behind the game. On a few rare occasions when things were quiet, I re-launched the game in debug mode, toggled the rendering overlay and gave a few people a peek at the engine's editor tools. Generally speaking, I feel like PAX probably wouldn't be the right fit for showing off that kind of stuff unless user created content was a big part of your game, and even then, perhaps a screen with a looping video demonstrating that might be better. People come and go so fast that it would be difficult to make sure that things are reset and that players immediately understood the difference between content created by developers with years of experience working on their game and content created by a distracted PAX attendee who didn't have much grasp of what they were doing. With Icicle games in general and Winter's Wake in particular, seeing the 3D geometry potentially flavours the impression that players might have - instead of imagining a vivid world, players can end up imagining blocky shapes and solid colours. In this case, I chose to show people what was behind the curtain only because I plan to make the engine available for others to use in the future, and a bit of practice at introducing/describing the editor tools to people who've expressed interest in using it is of value to me. I'm also hoping to run another pre-release Icicle Jam at some point soon to get extra feedback on in-development editor tools, and showing those is a good way for gauging interest. So far, I've seen two categories of concerns about the game. The first is that the game could work as more traditional text adventure/any other existing genre of game. I'm happy to ignore this as it's not relevant to the game I'm making and ignores some of what seems to resonate strongly with players who do appreciate the game (namely, the sense of a 3D environment surrounding the player), but assuming that that feedback isn't being given dismissively, the eagerness for more traditional text adventures that it must represent is nice. The other is worry that the game will become tedious if there's any amount of backtracking. This one is more interesting, but still hard to take at face value. Without familiar locations as spatial anchors, it's difficult to have context when exploring and discovering new locations. Instead of specifically avoiding backtracking (which while I may not have much of in the designed puzzles structure, players will definitely move back and forth on their own until they work out what the solution to a puzzle or situation might be), I feel that I should be focusing on making my world's environments interesting, engaging, and most importantly easy-to-notice-when-something-has-changed enough to be welcome when players revisit them. Unfortunately, the queues were long enough that there were people who didn't get to play. With the average play time across the event being around 14 minutes, three or four people in line represented a pretty significant wait even when shared across two machines. It's hard to guess at how many individuals didn't get to play but my gut says that it wasn't small. I did notice perhaps four or five people with press passes who didn't get a chance to play. Understandably, they didn't want to spend their time queuing when they had other games to check out, and all of them stopped by multiple times. Ideally, I'd have reached out and booked times for press to visit (PAX organisers send out a press list ahead of the event), but getting my game ready to be exhibited took priority. The press who did get to play seemed to enjoy the game, and what coverage the game received has so far been almost unanimously positive. Some, like Jody Macgregor, enjoyed the the way I was presenting the game, others, such as Meghann O'Neill (who also wrote Winter's Wake's first print coverage), appreciated the game's writing. 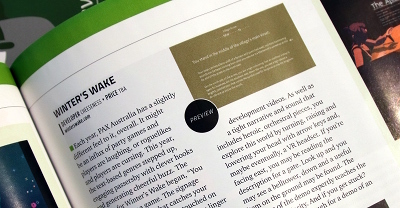 I've spotted thoughts, including those of Andrew O'Meara, on Winter's Wake's position within the lineage of games that reaches back to Colossal Cave and beyond. I've read accounts that speak of the allure of something different and unexpected as well as those that celebrate the way the game evokes familiar experiences and memories. In addition to traditional press, I also had a number of streamers/video creators (who are still people who take it upon themselves to disseminate their thoughts on games to other people) take interest in the game, including Urban Neurosis, who after PAX on Saturday, immediately went home and streamed the public demo. Largely, coverage seems to reflect the response I've had from non-press players, though perhaps with a slightly larger focus on my stand presentation and on the novelty of something that flies in the face of convention, but still manages to be grok-able without much explanation or direction. I did several impromptu interviews on the expo floor and a couple more afterward. Mostly, these focused on the game's elevator pitch, its inspirations, its mechanics, and when it's likely to be available. I had a few questions that focused on story, but generally deflected them, as I'd like players' expectations and first impressions to be formed while playing - that you take on the role of an adventurer in a fantasy world feels like it covers the essentials, and I'm happy to lean on whatever preconceptions and perceptual baggage players bring with them based on that. I've been compiling a list of press coverage, interviews and publicly shared stuff on social media, which can be found here. If you've come across something I don't have listed, or if you're written/shared something yourself, feel free to let me know! It wasn't until I was nearly finished with this article that I finally sat down to start working through the game logs I'd captured. My first attempts at working through them were foiled by some busted timestamps (a combination of a couple of bugs with the way that I'm putting together the first log entry), and I figured that it'd be easier to come back later with a bit more focus instead of trying to do detective work to piece everything together properly. That timestamp issue had also lead me to believe during PAX that I'd accidentally overwritten the first day's logs on one computer, so it was a pleasant surprise to discover that everything was salvageable when I did finally dig in. After a full day's worth of munging and wrestling with LibreOffice quirks (it turns out if you fill down an array formula in just the right way, the array gets expanded over multiple cells, making them impossible to edit, clear or unlock. Hooray! ), I managed to calculate play session durations and draw a bunch of interesting numbers from that. For most people who encountered it, this cutscene signalled the end of the game. For a few others, it was just the beginning. Across PAX Australia's three day run, plus some extra hours on Friday for Interface, Winter's Wake managed to have a total of 204 players, who cumulatively played the game for a little over 46 hours. 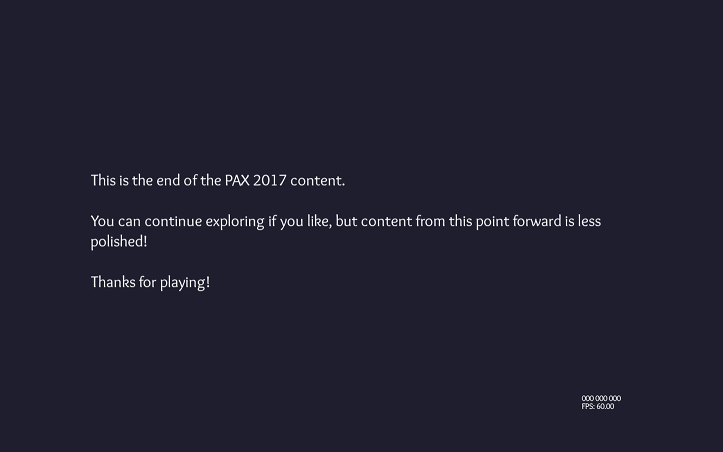 Of those players, 41.7% played through to the end of the content in the public demo, and a bit under half of those played through the extra semi-polished content I'd prepared specifically for PAX. Beyond that, there were three or so players who set out to explore the rest of the game's world that I'd left in for the super keen to discover. The game sat idle for nearly 9 hours, the majority of which happened on Friday, likely in the lead up to/during Interface, where there weren't queues or crowds, and I only interacted with the few people who sauntered around to take a look at the stands. The game only crashed on the Debian machine, which surprised me (but makes sense, since it had far less RAM than the Mac). The times that I'd assumed there were crashes on the Mac must have been times when a player quit from the main menu, but was too shy to say what had happened. It crashed a total nine times across the three day event, which was in line with the estimates I'd drawn from the first day. My memory of the event was that there was one woman who played for over an hour, but the longest individual play session that I can find in my logs was 40 minutes (still a long time to play at an event like PAX! ).I also hadn't spotted anybody who sat down to play and then immediately left, but sifting through the logs revealed a couple of players who skipped the intro after a few seconds, wiggled the mouse around, mashed some buttons and then left. The shortest of these lasted for 69 seconds and really gives a sense of impatience from reading the log. The in-game "readme" was viewed a total of ten times, and the game's credits were viewed once. The Icicle engine's logs are parseable as CSV files and will open in any spreadsheet application. Average playtime was a little shorter than I expected, and likely brought down by some of the shorter play sessions that I hadn't spotted as well as the times I restarted the game to quickly show off the editor tools or debug mode. Average play session duration across the event was nearly 14 minutes, increasing steadily from 12 minutes on Friday to 15 minutes on Sunday. Alongside this, the total number of players dropped significantly from 90 on Friday to 59 on Saturday and 55 on Sunday. 204 players isn't a huge sample, but these are still interesting numbers to look over and infer a little meaning from. 14 minutes for an average play session still feels long for a bustling event like PAX, especially for a slow, quiet adventure-game-ish thing. I'm still impressed by the 40 minute play session, but it's also possible that there were some players who played for a little while and then started again. I haven't had a lot of time to look at behavioural trends between the play sessions yet, but it has been fun to look at a few individual cases and draw some conclusions from those as I did with the shortest play sessions. Looking at when players check their inventory, how those few players who delved beyond the "The polished content ends here" notice approached exploring, and how long people wandered around for before spotting the road leading south around the village wall all feels like peering intimately into players' experiences. I'll be able to use this kind of information to help me spot points where a puzzle might be tricky or where an object might be difficult to spot - I don't always want to steer away from this, but being aware is never a bad thing. As a hobbyist stats junkie, this stuff makes me excited. A future feature I'm planning to add to the engine will allow me to play back these logs in-engine so that I can watch an approximated replay of players' actions. I'll likely revisit these logs in more detail then, but for now, I'm content to know that I've got a bunch of metrics to view my PAX experiences through and a whole lot of play logs to work through any time I want to focus on that kind of work. Total recorded play sessions per day. Total recorded playtime per day in hours. Mean play session length per day in minutes. For anybody super keen on more detail, I've also uploaded a copy of the calculated stats that I've derived from my play logs. PAX preparation hit me hard and fast. I'd been working solidly on Full Throttle Remastered for most of 2017, and afterward immediately dived into Winter's Wake dev. Uncertain of whether I'd have the game at a level that I wanted it to be before exhibiting, I left my application until the last minute. When the response came back, I had to work doubly hard because most of the submission deadlines for forms and artwork were passed or imminent. Since Winter's Wake is unrated, I had extra hoops to jump through, since PAX has a rule about not exhibiting unrated games without approval. The game's presentation makes things less explicit, but thematically, it touches lightly on some topics that may be confronting, and there are a some depictions of violent acts. I felt that it was important to be thorough and address the approval request form's questions in detail, but I also recognised that it might be possible to get the wrong idea about how the game is interacted with and how its content is presented. I also wasn't sure how much content I would be showing at PAX, so I needed to include detail on the largest possible version. Approval didn't arrive till the 19th of October (three days before my flight), leaving a very large and very stressful level of uncertainty hovering over my head for almost all of my pre-PAX preparation as I worked long hours and haemorrhaged money. We call this type of photo a "self portrait". Financially, exhibiting at PAX has been a large blow (more on that below), but it was something that I was able to budget for with money from my Full Throttle Remastered contract. This meant less money for living expenses and house repayments, but that was something I chose and was in a position to absorb. That said, I did have a lot of unplanned/unnecessary expenses as a result of mistakes and poor decisions, and that was pretty disconcerting. The level of work I needed to do before I left had me lowering the priority of sleep, exercise and relationships more than I'm comfortable with. This is definitely a failing of mine and something I try to be conscious of/work to correct. I've come a long way since the days when I used to sleep three nights a week, but it's still an area I need to improve upon. When I arrived in Melbourne, I took two days off. Partly because I didn't have power or internet access thanks to late check-ins, but mostly because I needed the rest. 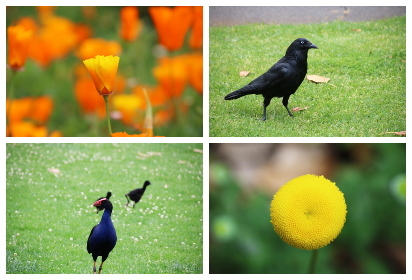 I spent most of my time in the Melbourne Royal Botanic Gardens walking, photographing plants and birds, and having naps. I got rained on and I got sunburned, but those two days were the most relaxing and most happy of the weeks surrounding PAX. This little break helped me feel refreshed and ready to tackle the coming week. Arriving early gave me a buffer period between the stress of travel and the stress of exhibiting. I feel like that gave me the opportunity to ensure that whatever last minute work I did was less rushed and more focused. Sharing accommodation with Nart was a nice chance to catch up and hang out with a long distance friend. I work from home and spend a lot of time alone. Getting used to co-existing with others can be a bit of a hurdle, but I think it's a worthwhile thing to do every now and again. Nart's experience with exhibiting his own game and his enthusiasm for mine made for a supportive environment to come home to that I was very appreciative of, and keenness to drag people over and/or recommend that they visit the stand definitely played a big role in the level of attention Winter's Wake received. Caroline assisted me with buying gear, and hung around to test the PAX build while I was working on last minute polish in the days leading up to PAX. I couldn't have done the level of testing we did on my own, and her assistance with set up and talking people through the game during PAX was invaluable. Caroline's company, enthusiasm, and willingness to speak up when she has an idea not only helped the event itself run smoothly, but also let me feel safe and confident that my game and I were in good hands. I don't normally spend much time away from Mim, so having her join me the day before PAX was a big comfort. Her love and support helps make everything a joy (when she's not tired or hungry), and her deep familiarity with the project gave me confidence and trust in her ability to represent the game. I've run Two Lof Bees stalls at local conventions before, but this was the first time I'd ever exhibited a game at an event of this scale, and it was definitely beyond daunting. Normally I get through these kinds of things by putting one foot in front of the other. In this case, the attention and positivity from other developers (both old friends and new ones) let me feel welcome and at ease. I don't think I've had so many back pats or vigorous handshakes in my life. One thing I did want to highlight specifically that speaks to the generosity and attention of the developer community was Damon Reece dropping by to give me some throat lozenges. Completely unsolicited and out of the blue, but very well timed and hugely appreciated. It was also super nice to see friends drop by to say hi. Many people from various communities I'm a part of also made time to stop by my stand in the midst of PAX's busyness to say hi and see how I was going. In most cases this was amplified by seeing people that I don't have the opportunity to interact with face to face. In the case of friends who play or develop less conventional games, I also felt a little bit like I was representing them, and whatever level of success a game like Winter's Wake had could in some ways be shared by other text adventures or narrative experiences or awesome weird stuff that might not seem like an intuitive fit for the PAX environment. At this point, I feel that I should make a confession. I wasn't quite as tired as my shirt made out. Although the ambient volume level had me pushing my voice harder than I'd have liked, I was carefully monitoring and managing my energy levels to make sure I wouldn't exceed my limits and keel over before PAX ended. By necessity, this extended to after hours as well. With the exception of Interface, I didn't attend any evening events across PAX, preferring to get a little work done on my game and get as much sleep as I could fit in. I'm pretty confident that if I had've attended the various evening parties/events I'd been invited to, I wouldn't have made it through PAX. And this brings me to the one thing that stands out as being significantly negative about my experience exhibiting at PAX Australia. I was disappointed to not get the game closer to being finished before PAX, and I was frustrated by discovering that the last second that OS level shortcuts were being triggered when Escape was pressed on my Mac, but these were things that I was both prepared and equipped to take onboard and deal with. The volume levels on the expo floor on Saturday and Sunday were not. Having sensitive hearing and a quiet game that doesn't exhibit well are things that affect me personally which might not be an issue to others, but beyond that, I am certain that conditions exceeded 85 decibels for periods long enough to cause lasting hearing damage thanks to a "loudness war" between large exhibitors with PA systems that pushed the ambient volume levels up across the weekend. The Enforcers (PAX volunteers) on the expo floor showed concern and empathy for my complaints (when they could hear me, that is - at one point, shouting from 1.5 metres away wasn't enough to be heard), but unfortunately, their actions weren't able to improve the situation. The Winter's Wake stand signage did a good job of looming. Many people may see this as being normal enough that it should be overlooked. To me, that indicates the normalisation of danger, and that is something even worse. These conditions make for an unsafe work environment, and it is both naive and unsustainable to see sacrificing the health of the industry's creative people as an acceptable exchange for visibility - we pay money for that. I regret not bringing audio monitoring equipment along with me so that I could assess and properly record volume levels, but not as much as I regret exposing myself and my volunteers to those conditions. Prior to the start of each day, I adjusted the volume on my noise cancelling headphones so that the game would be comfortably loud without exceeding safe ranges, but multiple people on Saturday and Sunday requested that it be increased. Not only do high volume levels put exhibitors at risk, but they also put attendees at risk. After PAX ended, I took some time out to go ice skating with Mim and Caroline. I'm terrible at ice skating, but I love it with all my heart (you don't have to be good at something to enjoy it!). It was nice to unwind in a way that let me focus/exert myself in something that let me put PAX reflection to one side and just appreciate the cold wind in my hair. I also went out for dinner with Refund, the composer working on my 64x64px space exploration/trading/combat game Hidden Star, where we mostly ignored PAX and chatted about other things (including a cool approach for increasing apparent variation in music without a lot of extra overhead). Whenever I talk about the costs associated with exhibiting, people often seem surprised (with the exception of those who've exhibited before). Travel isn't cheap, stands aren't cheap, and pulling together all the bits and pieces to make exhibiting possible isn't cheap either. If I were to make a ballpark generalisation based on my experiences, I'd say that if you run a tight ship, exhibiting at PAX is likely to cost a bit over double what attending would cost. At the very least, you still have the same travel, accommodation and food expenses, though depending on how you transport and store your gear, you might end up with different requirements. For example, I could have stayed in a shared dorm in a hostel, but I would have felt a bit less comfortable stowing my laptops, headphones and screens next to my bunk or in timed lockers (there's nothing more fun than miscalculating expiry times or getting stuck somewhere and then returning to find an open locker). That said, I intentionally tried to stay close by and exhibit with lightweight equipment so that I could avoid transport and storage overheads. 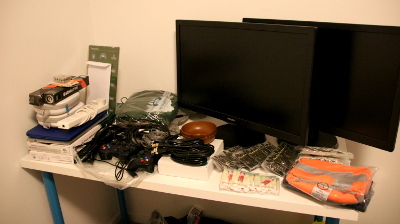 A photo of some of the equipment I had planned or attempted to use for PAX, but was not able to. In the leadup to PAX, I spent a lot of money on things that either didn't end up being used, or were a little superfluous. For example, I spent over $550 on headphones before I found the ones I ended up exhibiting with. I found other uses for those other headphones, so the money isn't entirely wasted, but within my PAX budget, that's $550 worth of expenses that didn't get me anything of value. On the flipside, I tried to make use of as much existing equipment as I could, using gear that I already owned, such as laptops, keyboards, A4 display stands, my badge press, and so forth (I would have taken mice if I hadn't lost one of the two spares I was planning to use). Instead of shipping equipment via freight, I carefully packed everything I needed for exhibiting as well as clothes and ice skates into my 90L hiking pack, which let me be (more or less) completely mobile on foot until I got the monitors I'd purchased in Melbourne. I did manage to offset some of my costs, though. Before flying over, I put out word that I'd have two mostly-unused monitors that I'd be happy to find new homes for. I was able to find some friends who offered to pay full price for them and pick them up on Sunday after the expo hall closed, so they ended up being cost-neutral. This also meant that I didn't have to find a way to safely ship them home (though, I think I would likely have tried to donate the screens to The Arcade if they had use for them instead of bringing them back with me). Nart also generously offered to cover/refused to accept money for accommodation costs, which had a big impact on my bottom line. To thank Caroline for her help, I shouted her dinner a couple of times and also gave her the plastic tubs I bought to raise my laptops off the floor. I bought a couple of extra Winter's Wake t-shirts to give to some of my long-time friends/supporters. I also forked out some money to go ice skating and marked these kinds of things as unnecessary in my cost analysis, but in terms of looking after one's self and one's team, they're pretty important. A summary of my PAX Australia expenses summary broken down into "necessary" and "unnecessary" costs. After running over numbers and weighing up what I could flag as "necessary" and "unnecessary," and taking into account recovered/offset costs, I've arrived at two figures that I'm paying particular attention to. The first is $6,203, which is the amount of money that exhibiting at PAX Australia cost me, including all the purchasing mistakes and "unnecessary" expenditures along the way. I don't regret this, but it's super important to have awareness of in the context of the next figure when thinking about planned costs vs unplanned costs. The other figure is, of course, the total "necessary" costs, which adds up to $3,542. A bit over half of my expenses were things I could have cut if I had to. 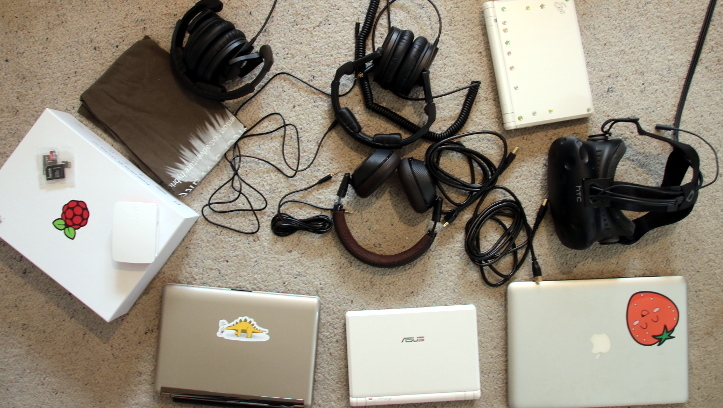 Some of these are obvious - if I could go back in time and avoid buying things like the headphones and the Raspberry Pi that I didn't end up using, I think I'd do that, and then weigh up the uses that I've found for them outside of the PAX madness. Others are things that I wouldn't budge on, but still like to have awareness of, such as ice skating or accommodation costs for extra nights in Melbourne after PAX was over. That said, it's impossible to predict everything - you can't think of stuff you've forgotten, otherwise it wouldn't be forgotten anymore. Having an understanding of the scope and scale of unforeseen expenses makes it easier to have a feel for how much to allow for in the future. Breakdown of total expenses minus offsets into "necessary" and "unnecessary" gear and accommodation/travel/food. It's also worth noting that what I assess as "necessary" and "unnecessary" is greatly influenced by my status as an independent developer, getting by with second hand gear and without paying myself. If I were running a company with employees, I'd be paying wages, covering additional insurance, and organising separate accommodation for my team. For a more detailed list, I've uploaded my expenses breakdown in case it's of value to anybody. I suspect that some readers may have been hoping that I would be focusing on whether or not PAX was "worth it" in this section. From a financial point of view, it's very difficult for me to address that directly without having a game that's ready for sale (and since I forgot to mention other methods of supporting development, I'm not surprised to see that there hasn't been much movement on that front either). I also haven't exhibited at any gaming events of scale (not that we have many here) to offer a comparison to. The best I can do is be open about what my overheads were and let others weigh that up for themselves. My intentions for exhibiting In the Snowy Winter's Wake at PAX were always to give me an experience that I could learn from, to see what results my existing instincts and insights could lead me toward, and to see what new ideas the experience itself would inspire. I had a few things that I had wanted to do, but either ran out of time or resources to achieve, as well as some ideas that probably weren't so great. For example, I'd considered looking into how much work would be involved in getting a lenticular imitation of the in-game compass together that appeared to rotate correctly as you moved past it, either to go on the stand's sign or to go onto my t-shirt, but the effort involved seemed high and the likelihood of it looking good low. I toyed with other ideas for "merchandise" and affectations such as a bandanna covered with the title text from in-game objects' descriptions, and a similar shirt, but didn't get around to designing either. I also back and forthed on whether getting postcards with the new mountain design on them would be worthwhile, but eventually decided to not for no reason other than that I was already spending a lot of money on other stuff and this was an easy thing to cut. In hindsight, I think there might have been enough interest to justify getting a few hundred. All of these cards disappeared so quickly. I definitely would have ordered more business cards (and updated the design to not say "in-development"). Taking into consideration that there are people who will avoid taking things when they see a shortage, I'd probably go as high as 1,500 cards, though that increases the risk of winding up with leftovers if your game isn't getting a lot of attention (not a problem for me since I had plans for leftovers). As mentioned a few times, I would have popped the game's URL on the stand signage to squeeze another point of contact into all those photos that people took of the stand. I feel like some kind of hashtag or similar to help me find and track the game's propagation through social networks would also have been of benefit. While thinking of a way to get useful feedback from players, I considered taking inspiration from Chris Johnson's experiences with exhibiting Expand and invite players to write down a single word or short sentence about what the game meant to them. I would have stuck these to the blank spots on the lower part of my stand's signage and collected them at the end of the day. I really like the idea of inviting players to distil their thoughts down into something small. It requires a degree of reflection that often doesn't come out when having a quick post-play chat. My plan was to look at getting custom shaped dark green sticky notes done in the silhouette of the mountain that people could write on with a white pen, and when I ran out of time to do that, just dark green sticky notes, but those proved hard to find and the idea of sticking tan coloured notes on didn't really get me excited. It also turned out that in reality, the obscured space was awkward to get to, so this would have been tricky to make work anyway. While writing this article and reflecting on how great it was that somebody drew a map, it occurred to me that a small pad and a pen that people could write, scribble, scrawl or draw whatever they liked on could have been a nice/affordable option. I'd likely have had these custom printed with the mountain, game title, URL, etc. at the top and some space for people to write some contact details (email address, or whatever else suited them) at the bottom. I'd file the page away when a player finished, or alternatively, take a photo and let them keep it. This would have given me some fun stuff to analyse after the event, and potentially also a list of people to reach out to when I had updates on the game/give attribution to for anything that I used their scribbles for. As mentioned earlier, I would have liked to have gotten the game close to finished or even completed entirely before exhibiting. At the time that I exhibited, I felt like I was in a bit of a middle ground - beyond the point where my planned crowdfunding campaign to support the rest of development didn't seem quite as critical any more, but with enough development left to do that there was no way I could launch the game at/around PAX. Either of those feel like they're points at which I could have drawn increased benefit from the visibility I had at the event, since the game has a high novelty value and it makes sense to make the most of as much enthusiasm in the moment as possible. Both of these options would definitely have required additional attention/time though, which I would have to have brought additional people onboard to help cover. As part of the development I would have liked to have gotten done, VR support is something that I really would have liked to have had polished to a point where I was comfortable showing it off (I even went so far as ordering Winter's Wake stickers, which never arrived, to put on my Vive). I feel like it would have been a significant attractor and would have had a big impact on the amount of enthusiasm and coverage the game's presence at PAX generated. That would have brought in some extra concerns though, with regard to space - In the Snowy Winter's Wake works as a seated experience, but players are effectively blind folded and allocating space around players who can't see is super important. I likely would have needed extra approval to tape out a safe space for players to exist within. I think also that there is a potential risk of driving away players who are specifically not interested in VR experiences that I would have had to have weighed up and accounted for with the presentation of the game and its stand. Another thing that I missed out on implementing was some additional music. Anton gave me a handful of tracks, and I was able to squeeze some into the post-demo content that I'd made accessible, but the real treasure (that I'd reworked the music handing system to implement) is hidden in a later section of the game. If I had've been able to polish up the rest of the content, I would have felt comfortable popping in a shortcut to access that outside of the game's narrative just because it's so good. 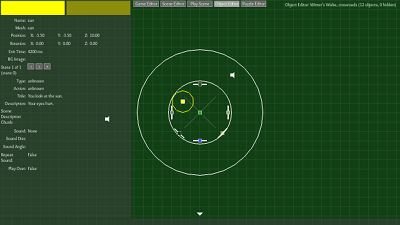 A commit log showing some pre-PAX development work, including a new music handling system. My strong development focus in the leadup to PAX meant that I neglected a few other things that I would have given more attention to in hindsight. Giving the website an update, publishing an updated demo, adding a press kit, and so forth would have made it easier for press and excited players to find out more and experience more outside of the event. On the note of press, I definitely would have liked to have contacted people ahead of the event and tried to book times to have chats, but I think also having a spare laptop and a tiny bit of desk space spare to pull out another machine when there were big queues would have helped. It wasn't until I got home that I realised that I didn't promote my Patreon campaign at all (this was before the announcement of their proposed fee changes). Since this helps support me working on the game, and has also provided funds that have directly benefited the production of the game, this feels like it would have been relevant and useful. I would also have liked to have thought to let players know that I'd be happy to hear from them/chat about their experience outside of PAX. Jasmine and Anton's contributions are an integral part of both Winter's Wake's existence and its identity. I would very much have liked to have been able to give them some presence and to specifically highlight their work. Perhaps this could have been done as an insert in the stand signage, or as another A4 display stand (not that I had room for one of those. It could also have been via voiced additions to the in-game "readme," but since few players looked at that, it wouldn't have been very effective. If I had the budget, I would have offered to fly them over as well, but that's a bit more costly. While I am immensely thankful to Mim, Caroline and Nart for stepping up and helping out around the stand more than I'd initially asked them to, I feel like it would have been better for me to have planned for a lot of attention as a contingency and assessed their comfort levels and availability ahead of time. A roster would have let me manage their exposure to the expo hall conditions and made sure that they got frequent rest/breaks. It would also have let me feel more comfortable ducking off myself if I had needed. One or two extra stand-by people probably would have been valuable as well had I had any suspicion that Winter's Wake would have gotten half the attention it did. Similarly, while I think that we did a good job of handling that attention given that we weren't prepared for it, I should also have put together a system for handling queuing. On Saturday, after I'd accidentally pushed some people in front of others who had been waiting, I set up an impromptu coordination system that had us interrupting the other volunteers to let them know when we added someone new to the end of the queue. This was effective and less disruptive than messing up queue ordering, but it was still disruptive and could have easily not worked if any of us hadn't been paying attention. I did hear of another developer who had a clipboard with a list of times on it, allowing players to "book" a time to come back instead of waiting in a queue (presumably empty time was filled ad-hoc), and I think this could have been a good fit for what we had going. I suspect that this would have impacted on the ways that crowds formed around the stand, though. It would have also been beneficial to have a person set up to photograph the stand and crowds (I'd hoped to do that myself, but it was busy enough that the only time I was really able to get my camera out during opening hours was when I absolutely had to get a photo of that business card map). There were a few photos taken by friends that I've seen, but it would have been nice to have someone who swung by regularly and had a chance to observe and capture the ebb and flow across the event. A little more technical and specific, if I had more time, I would have liked to have written a log cycling script that automatically moved logs to date named folders. I did this by hand on the morning of each day and managed to throw myself into a panic, believing that I'd accidentally overwritten one of the previous days' logs. A little less rush and a little more focus would have helped that, but a script that handled naming automatically and avoided overwriting would have been faster and more reliable. I had considered submitting talk proposals to both Unite and GCAP. I feel like my experiences with assisting other developers with shipping numerous Unity games on Linux/overcoming Linux specific would have been a good fit for Unite, and a talk on my experiences of working on Full Throttle Remastered and Day of the Tentacle Remastered could have been wrangled to touch on the GCAP "ripple effect" theme. These were among the first ideas I discarded when it became evident that I'd need to work hard to get Winter's Wake up to a point where I could exhibit it, but I think that if I had have been able to do either of those talks, a little extra mindshare among developers could have amplified my presence even more. A quick recap of PAX tooted on Mastodon after the event. Which brings me to the final thing I would have done differently: knowing how things turned out, I'm really not certain that I would have exhibited. I had a lot of positive outcomes, and I am definitely keen to make the most of my time at PAX, but the discomfort and pain I experienced as a result of unsafe volume levels, and the risk that I put my volunteers at make me uncertain. It disappoints me to end on such a note, but this is something that continues to weigh heavily on me, and feels important to highlight. It seems too often that unhealthy conditions are seen to be "just the way things are," and that it's not uncommon to come across narratives that celebrate unnecessary sacrifice and suffering either for the sake of art or that attempt to dismiss concern by framing being thankful for opportunities as being incompatible with striving for positive change. The idea that events like PAX should be inaccessible to anybody who can't cope with its conditions feels reductive and resistant to improvement in a way that seems to be at odds with the PAX Rising spirit of giving a space and a voice to smaller developers who don't have the power or the reach of bigger, louder players in the industry. Before anybody takes away the wrong idea here, I do think it's wonderful that we have an event like PAX in Australia, and I look forward to seeing it continue to improve both for exhibitors and attendees in the future. I don't think that that improvement can happen without shining a light on the shortcomings it has, especially when they represent health risks. If you'd like to know more about In the Snowy Winter's Wake and its development, you can visit winterswake.com, check out the updated demo on itch.io, follow @WintersWakeGame on Twitter, watch the Winter's Wake playlist on YouTube, view the Winter's Wake tag on Patreon, or even go all the way back to the beginning and read the dev blog posts on the 7DFPS website. This article has been a long time in coming, so for anybody who's been hanging out for it, thanks for your patience. Thanks also to Peter Thompson from ReedPOP (the company that organises/manages/runs PAX Australia), who offered me what was apparently the last remaining PAX Rising stand even though my application was super late. An extra big thanks to all my friends and colleagues who either dropped by to say hi or who took time to reach out and say something supportive in the lead up to/during PAX. And the very biggest of thank-yous to Caroline, Sanatana and Mim for their support and assistance across PAX. I couldn't have done it without you! All photos except for the two indicated in the Player reception section (thanks Mim!) were taken by me. More photos from my PAX 2017 trip (by which I mean, a handful of photos from PAX and a whole lot more of birds and flowers) can be found on this Flickr album. This kind of compliment has always bemused me, but in this case, it feels like it directly misrepresents the kind of work I've been doing here. I've been working my backside off to create and improve the world around me, but I'm not doing so in ways that are destructive. The hurdles I've been facing have been navigated through understanding rather than force, and I haven't really cleared way for those that follow behind so much as left a small trail of bread crumbs as I wend and weave my way through them. I'm not deconstructing or breaking downperceptions or prejudices in any meaningful way so far anything related to Winter's Wake goes. The only thing I could really be seen to be breaking here is convention and even then, it's not done lightly and to be honest, I feel like I'm leaning on more convention than I'm actively working against. I do thoroughly appreciate the positive sentiment, though. Hello! If you are this person (or anybody else who played In the Snowy Winter's Wake at PAX), I would love the opportunity to chat some more with you about your experiences! Drop me an electric metaphorical line. 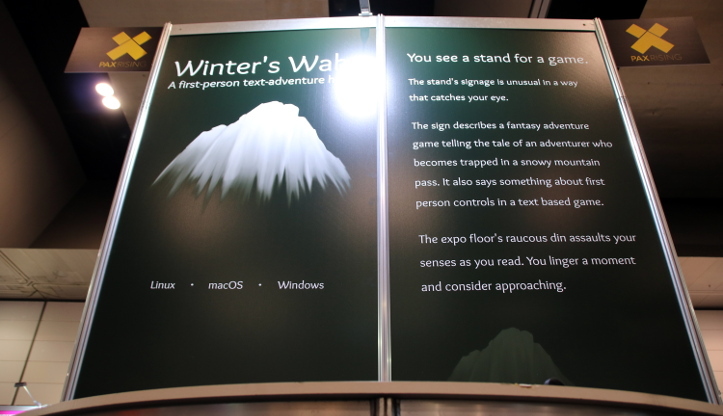 Exhibiting at PAX Australia gave me voice, visibility and prominence beyond what developers who work on more traditional text adventures and interactive fiction might typically have. Because of this, I feel that I have a responsibility to highlight that text based experiences never really went away. Sure, some evolved into alternative, more "modern" takes on how text can be presented to players (which Winter's Wake/Icicle definitely fall into), but there are rich and vibrant communities of people making more traditional stuff with Twine, Inform, TADS, ChoiceScript, and so on. IFComp, an annual interactive fiction competition in its 23rd year had nearly eighty submissions in 2017 alone, and is probably one of the best ways to get a cross section of what people are making/exploring. The IntFiction.org forum has thousands of users sharing, discussing and coordinating works. These two places may be two of the main hubs around which the broader interactive fiction community revolves and the best starting points for easing in, but there are yet more pockets of creators and players squirrelled away. My point is that if you love this stuff, it's out there. Go find it, play it, celebrate it, and signal boost it. The best thing you can do for interactive fiction and text adventures is let the world know that they're not dead! These pre-release Icicle Jam events are geared towards supporting development by giving feedback on editor tools and suggested workflows. If you are interested in learning more and would like to express interest in participating, or if you'd like to talk about functional requirements for a future Icicle engine project, shoot me an email and we can discuss what's involved! If you're super interested in this kind of stuff, I streamed myself working on it. An archive can be found here. It's long and it's boring, and I forget to update the window that I'm streaming a few times, but if that's what you're into, enjoy! If a prospective player asked me whether Winte'rs Wake was a violent game, I'd likely answer no, but for a content rating assessment, it feels super important to not gloss over anything. As with , this is not something I really want to bring attention to or have players fixating on at the beginning of the game. I'm in two minds about crowdfunding for Winter's Wake. On one hand, the security/peace of mind of having some dedicated money to fall back on would be nice. On the other hand, I think that if I can get through the rest of the game without it (which I believe I can), then it's best for me to just focus on development instead. Anybody who really wants to support me has other methods to do so. This article was first published on the 2nd of February 2018.